The new Cap Camarat 9.0 WA revisits the concept of the 8.5 WA, a sporty boat with a familyfriendly spirit, which as been a great success. With her pure, streamlined design inspired by the Cap Camarat 10.5 WA, her look is decidedly on trend! Her traditional V-shaped hull was designed by Michaël Peters. Stable and powerful, her hull ensures excellent seakeeping and very secure handling at sea for family cruising or sporty outings. The layout and spacial organisation of the Cap Camarat 9.0 WA make her the ideal boat for day trips or weekend cruises. On the exterior, the vast cockpit benefits from a helm station with seating for two, a portside galley and numerous storage options. On the interior, the new Cap Camarat 9.0 WA will delight all those who appreciate full comfort: she features a very large double berth, a saloon that also converts into a double berth, a head compartment with separate shower, a «breakfast nook» and copious storage. 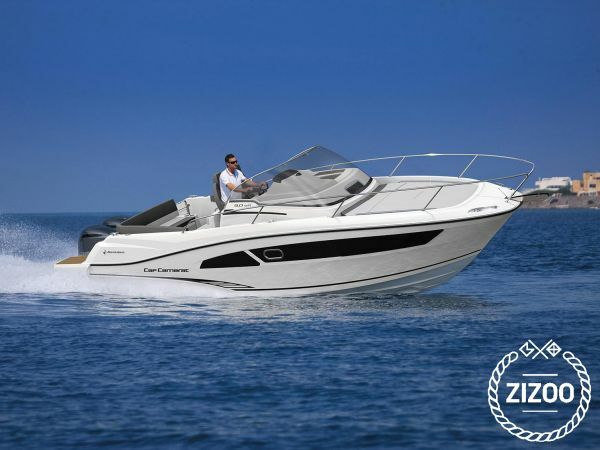 Perfect for family cruising, this new model also features long windows in the hull for an extremely bright interior. The Cap Camarat 9.0 Walk-Around will be presented for the first time at the Cannes Boat Show this September.